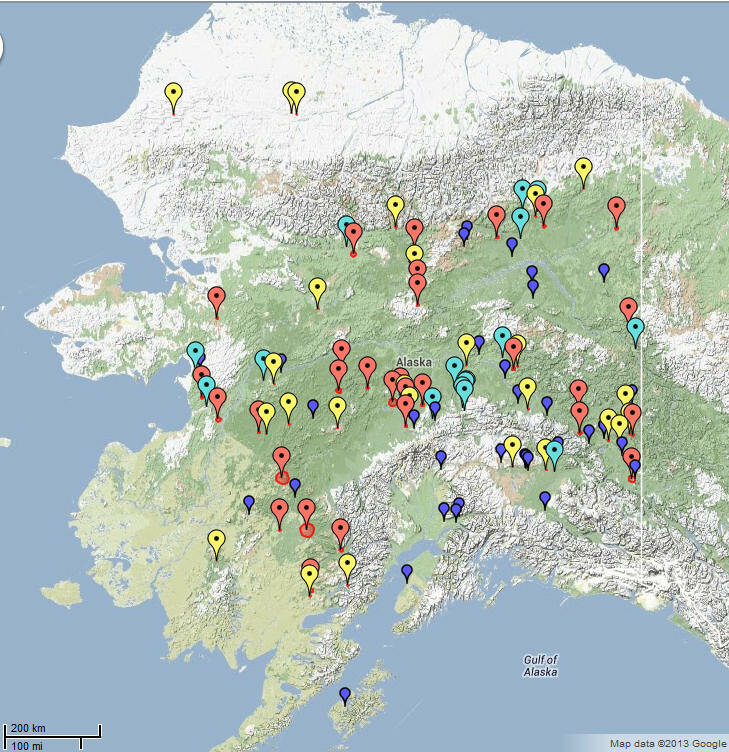 It’s been an interesting summer so far in interior Alaska. First we had snow and low temperatures until mid-May, and then we had about 3 weeks of 80 and 90 degree weather. When you live somewhere that is cold and dry for 8 or 9 months of the year any heat you can get is like charging some inner battery. So let’s just say we have adequately charged our batteries…life was great…until the smoke rolled in! Right now we have well over a hundred fires burning throughout Alaska, some small and some large, some being fought near towns and some being left alone to burn. One of the fires that is plaguing us is Skinny’s Road fire, the yellow dot that is close to the upper right of the word Alaska on the map. It’s about 20 miles away from us and on the other side of the Parks Highway. But any of the ones in that general area could be causing the our smoke problems right now. The crazy thing is, you can go to bed with a heavy smokey haze outside and wake up to a bright clear day because wind patterns are changing so much. So Jack and I are constantly sniffing the air to decide when to close or open the windows. The smoke affects certain people more than others and Jack is not greatly affected. He even went out and chainsawed some logs last weekend with the mosquitoes and haze surrounding him. A day off is a day off and you have to get something done. But I have to stay inside because I feel a heaviness in my chest when the smoke gets bad, and if I breathe it in too long my sinuses and allergies act up too. People with asthma and respiratory problems like COPD are in big trouble if they don’t get into a safer environment. Just about everyone gets a headache if out in it for too long. All in all, here at our house Jack and I have had only about 48 hours of dense dangerous smoke, so we are beyond thankful for that, considering how many are burning around us as you can see from the map. 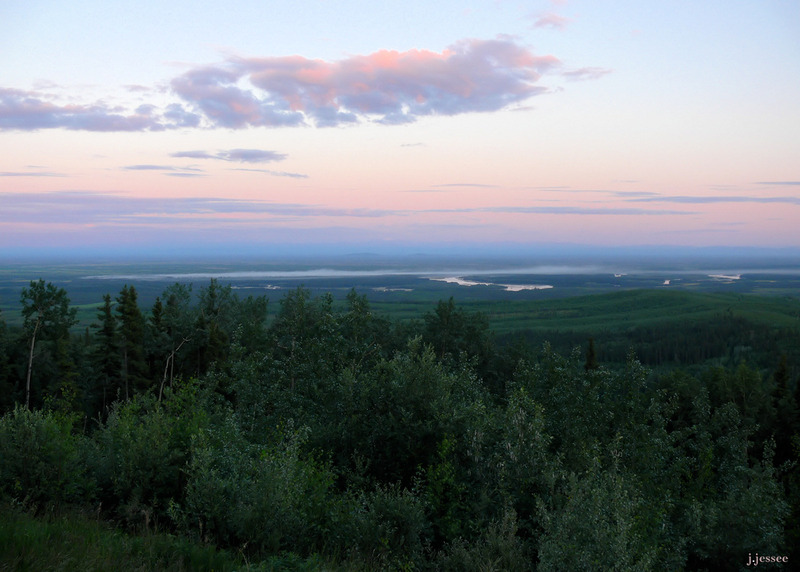 Below is a photo from June 21st, 2010, late in the evening under the midnight sun during Solstice, looking southward down from a turnout on the Parks Highway onto the Tanana Valley where a fire smolders (on the left in the photo) and sends its wispy smoke westward (to the right). Click it for a larger image. Best wishes for a safe and enjoyable Fourth of July! This entry was posted in Scenery and tagged alaska, asthma, climate, environment, fairbanks, forest fire, forest fires, interior alaska, jack jessee, nature, parks highway, respiratory, skinny's road, smoke, summer, wildfire. Sure hope the fires are put out soon. Summer isn’t being nice to you this year. Thanks for all the information about your state. It is fascinating.